It’s not just us, the travelers and expats, who get excited about moving abroad… our pets do too! A stroll around the Louvre, balcony views of the Sydney Harbour Bridge, or a game of catch around Central Park, we just want to give our furry friends the best. That’s why getting them to their new home safe and comfortable requires some careful planning and attention to detail. It goes without saying that your pet’s well-being should always be the main concern when transporting them overseas. Traveling can be a stressful experience for any person and that only multiplies for an animal whose flight seat is in a travel carrier. And as you may expect, all airlines have different regulations when it comes to bringing pets on board so it might pay off to contact a few different companies before booking your ticket. Before you decide to bring your animal friend overseas with you, it’s important to ask yourself a few questions first. 1. Is my pet healthy enough to fly in a plane? Some important things to consider before traveling with your pet on a flight are: the age of the animal, if any existing health conditions could worsen because of travel, and whether their personality can withhold the stress of the flight. Many times, a health record from your home vet is needed prior to boarding. 2. Can my pet legally be brought into the Country? Some countries are more pet-friendlier than others. Do your research to see what paperwork is required upon arrival and whether other requirements such as an IOS pet microchip or quarantine will need to be arranged. You can find a detailed list of countries and their requirements on PetTravel.com. 3. Do I need to check my pet as cargo or can he/she come on board with me as a carry-on? This decision will affect both the cost of the pet transport and the experience of the transfer. See below for some more information. Carry-on can go as low as $30 on some airlines, whereas cargo carriers can soar up to $1,100 for a one-way flight! As a flight attendant, I get to see many animals board the cabin as carry-on luggage. From the cute and fluffy to the growling and whiny, it’s safe to say I’ve seen it all. Recently I operated a flight from Lima, Peru to Toronto, Canada (an eight+ hour flight) where we had the sweetest, softest, green-eyed mixed mutt puppy on board that I have ever seen. Lucy, the passenger and proud new fur mama, had gone to Lima with no intention of coming back to Canada +1. Let me tell you a bit about Lucy’s experience to give you an idea on how the process worked for her (keeping in mind Lucy only had two days to plan the Peruvian pups flight). The nameless green-eyed pup caught Lucy’s attention after visiting a volunteer animal rescue in Lima, Peru. She immediately contacted the airline she was flying home with to ask about their requirements and after finding out she could bring the pup on board with her, she set out to buy a carrier that fits the required sized allotments (10.5 x 15.5 x 21.5 for a soft case). The very next day she brought her new animal friend to a registered veterinary clinic to have his rabies shots (a requirement to enter Canada from Peru) and left with a hardcopy of the paperwork.Voila! In less than two days, a new cozy home was just a plane ride away for this pup that otherwise might have ended up on the streets of Lima. I won’t lie; the thought of having animals in the cargo hold of an airplane had made me feel a little unsettled in the past.An important clarification that certainly changed my views is to note that cargo animals are not crammed in a big, dark hole in the belly of the plane. Instead, they are placed into a temperature controlled and pressurized compartment which is completely separate from all the checked baggage. And contrary to both you and I who are often sitting in our plane seats well before take off, all animals traveling in cargo are the last to go on and the first to come off and are handled with extreme care by baggage professionals. 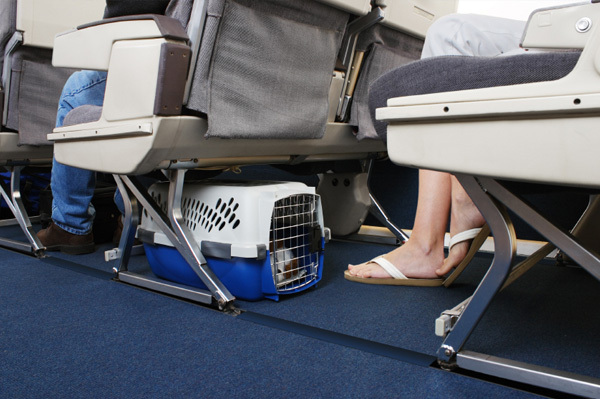 Before the flight, it’s helpful to get your pet well acquainted with the carrier it’ll be traveling in. It is imperative there’s enough room in the cargo crate for your pet to get up, move around and lay down comfortably. I talked with Rachel from AirAnimal.com who said her #1 tip was to make sure to leave items with your scent in the carrier for the flight: socks, a t-shirt, or a blanket work wonders. Give him/her a few toys to play with during the flight, too. 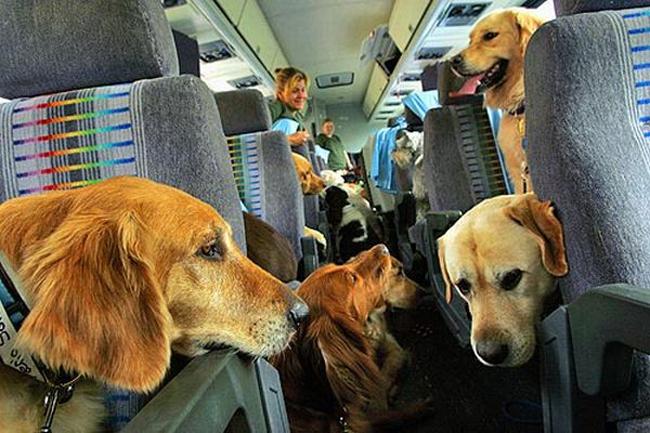 Keep in mind airlines transport animals safely worldwide thousands of times a year. Don’t be shy to ask the gate agent or flight attendant to advise you when your pet has been loaded in the designated animal cargo area. For more information, I really liked this article by National Geographic on the quirky rules to traveling with pets overseas. What are some of your tips and tricks when it comes to transiting pets overseas?